"These delicious burgers will make you think twice about eating chicken!" In a large bowl, combine the ground beef, jalapeno peppers, blue cheese, onion powder, garlic powder, tamari and salt. Mix well using your hands. Pat lightly into 4 large fat patties. Place patties on the grill, and cook for about 8 minutes per side, or until well done. 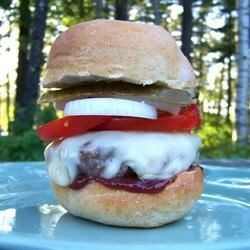 Place a slice of cheese on top of each patty, and cover the grill until the cheese melts. Serve on buns with your favorite toppings. Just love this recipe, new favorite !!! Used gorgonzola cheese, even tried it with ground turkey for a healthier twist. Thanks for a great recipe. These are wonderful!!! I used feta instead of blue cheese due to family choice. I did add one egg and had no issues. Yummy!! This recipe was out of this world!!! Absolutely delightful and different! Kudos and I encourage everyone to make this recipe!